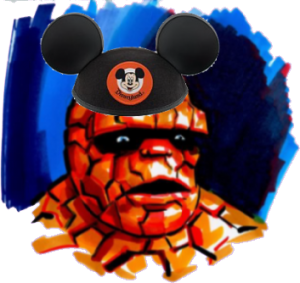 Today, I read that Disney was buying Marvel Comics for 4 Billion. I wish I had something to sell for 4 Billion. Anyway It seems odd to me that the literature of my adolescence would be owned by Disney. I guess there’s nothing wrong with that, but It produces some images in my head that make me giggle. What if the Sorcerer’s Apprentice had to confront Dr Doom? Or how about Fantastic 4 Action Figures in Toy Story? X-Men Replace the 7 Dwarfs? I’ve read that The Mighty Thor is in the works to be made into a film. (Finally!) I wonder if this deal is going to have any impact on that ? Disney says that existing deals will remain. 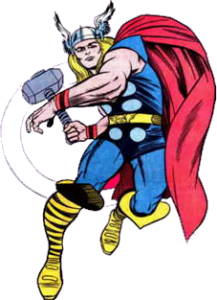 (But you know how that goes) I’ve been waiting for years for Thor to hit the big screen. We used to sit around and play the casting game. I’ve been thinking about this long enough, that Dolph Lundgren was young enough to play the part back then. I always thought Willem Dafoe looked a little like Loki. These days I think it would be fun to see Sean Connery as Odin. From what I’ve read, the casting is set, but who knows? Rumor had it that Daniel Craig was approached about playing Thor, but turned it down. Rumors. Maybe Pixar will do a lot of Computer generated Marvel flicks now. We can expect to see a Marvel presence in Disneyland in the future. Maybe we can ride The Silver Surfer’s Surfboard. Or, perhaps we can cross the Rainbow Bridge to Asgaard. It will be interesting. I heard that he was to eager do a Neighbours cameo! :O. Not sure how true this is, has anyone else heard it? There’s a bit of me that sort of wishes this is not true lol.